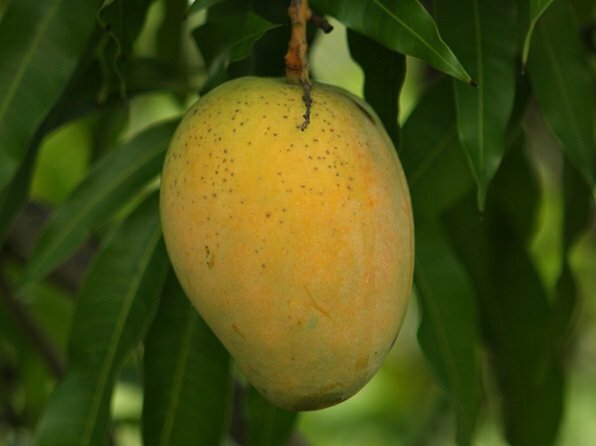 &QUOT;ALPHONSO&QUOT; IS A TRADITIONAL INDIAN MANGO RENOWNED FOR IT'S RICH FLAVOR AND SMOOTH TEXTURE. WHEN RIPE THE SKIN IS GREENISH YELLOW TO YELLOW AND PULP IS DEEP ORANGE AND HIGHLY AROMATIC. THE TREES TOLERATE THE ABUNDANT RAIN AND HIGH HUMIDITY OF SOUTH FLORIDA VERY WELL WHICH IS SOMEWHAT UNUSUAL FOR TRADITIONAL INDIAN TYPES. THIS MAKES THE TREE A GOOD PRODUCER OF HIGH QUALITY FRUIT TYPICALLY WEIGHING 0.5-0.75 LBS AND RIPENING IN LATE JUNE TO JULY.